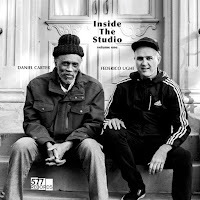 It's hard to keep up with the recorded output of multi-instrumentalist and New York free jazz icon Daniel Carter, and my estimate is that he appeared on no less than twelve albums last year, even if not always as a leader. Some of his earlier bands such as Test and Other Dimensions In Music, made the already forward-thinking New York jazz scene even more progressive musically. Despite his output and his influence and presence in the avant-garde jazz scene, he remains self-effacing in all his musical endeavours, putting the music in front, rather than his personality or ego. The list of albums reviewed here will show his strong musical versatility: in the use of multiple instruments, the mastering of various musical styles, the possibility to adapt and perform in different settings and ensembles, but without losing his own character and vision. 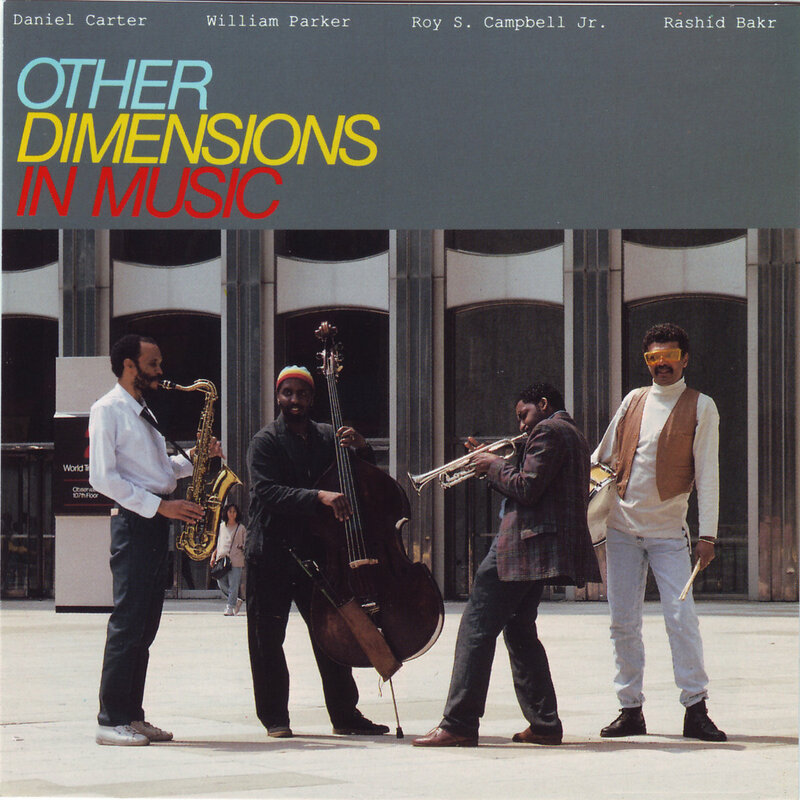 Carter is not an iconoclast (like Ayler, Coleman, Brötzmann), he is not the signature voice musician (like Brötzmann, Gustafsson, Evan Parker), he is not the virtuoso instrumentalist (like Vandermark, Wadada Leo Smith, John Butcher), he is not the towering musical personality (like Wadada Leo Smith, Evan Parker, William Parker), nor does he seem to care. He appears to be interested in music, and in music for its own sake, performing on all saxes, trumpet, clarinet and flute, performing in all sorts of bands and musical settings, all very much of influence, but largely under the radar, unseen but shaping, invisible but very present. Curiosity and a genuine interest in mixing with other voices seems to of higher interest than making his own voice heard. A good reason for us to give Daniel Carter some more attention. We already highlighted the excellent "Seraphic Light" earlier this year, but these ones are also worth looking for. 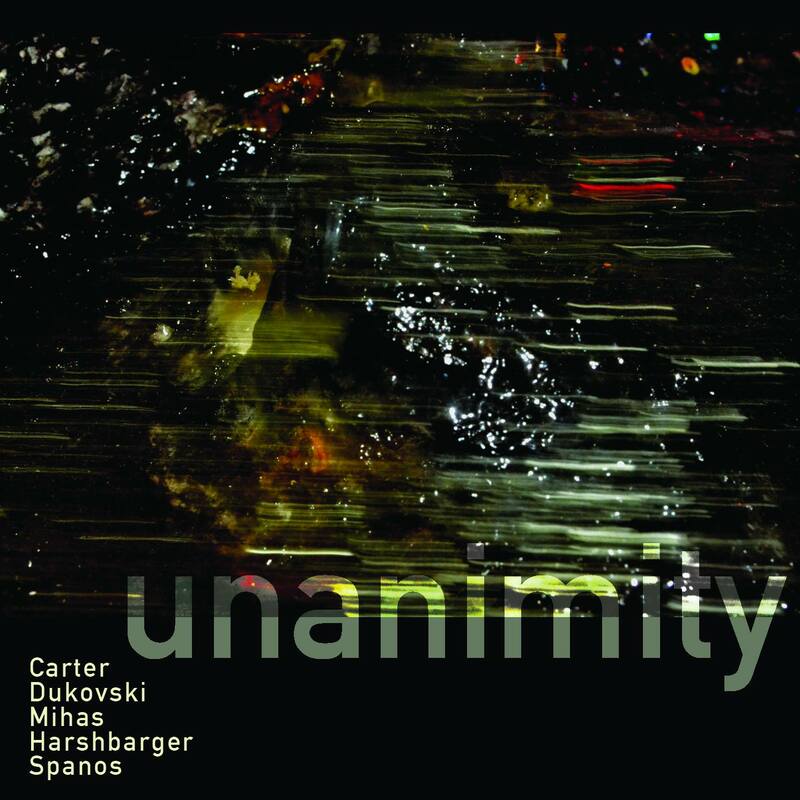 Unanimity is a first collaboration of five musicians, all based in New York but with different musical backgrounds. Vasko Dukovski is a clarinetist from Macedonia, but trained in the United States, and very active in several contemporary music ensembles, spanning from Bang On A Can to the Either/Orchestra. Stelios Mihas is a guitarist from Greece, classically trained, and active in the United States, in several ensembles, including the free improvisation band, The Listening Group. Jeff Harshbarger is an award-winning bassist, who has played in a multitude of bands of which Jacob Fred Jazz Odyssey is probably the best known. 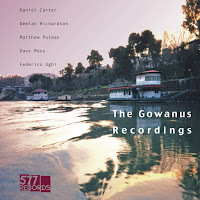 George Spanos is a Greek drummer, also living in the United States, and who has performed with artists such as John Zorn, Ikue Mori, Juini Booth, Lawrence Clark, Marc Ribot, On ka'a Davis, Sylvie Courvoisier and Erik Friendlander. This is the band's first collective performance, and the outcome is powerful and amazingly cohesive for musicians who've barely played together. All tracks are fully improvised, and the craftmanship and listening skills of this US-Greek-Macedonian quintet is more than above average. 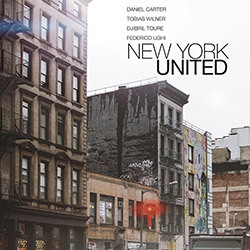 The intro of the opening track sounds like a well-rehearsed atmospheric piece, much in the same vein as Other Dimensions In Music, with music that flows along the backbone of Carter's slow trumpet phrases, while the other musicians accompany him, with granular interjections and supportive emphasis, increasingly developing their own narrative of agitated counterpoint, and when this becomes solid enough in its own right, Carter picks up his sax to expand and change the sound towards more energy and speed. Michas' dry and somewhat dirty guitar sound is possibly one of the most memorable elements of the piece. The second track, "The Variety Of Things And Beings", is much more explorative, with sounds colliding in an unstructured way, full of surprises, yet again resulting in a quite unique and coherent whole. At times it somehow reminds me of early King Crimson improvisations, with lots of little sounds and open space at the beginning, picking up density as the tune evolves, led by Spanos' clattering and rattling drumming, and the frenzied shrieks of both clarinet and guitar. 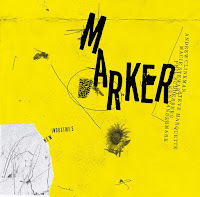 Harshbarger opens the "pièce de résistance" of the album, the eighteen minute closing improvisation, with a rhythmic throbbing bass, then cedes the place for calm guitar and clarinet. The music takes its time to develop, and that is just great, because it takes us along a meandering kaleidoscopic sonic journey, from beautiful quiet passages to harsh intensity. 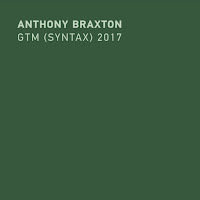 According to the liner notes "This album serves as a manifested testament, as a seed for a collective consciousness/unanimity for the posterity of the variety of things and beings with the proposition of achieving balanced harmony in the greater spectrum on the planet and in the distant future beyond the heliosphere". We truly hope it does. The performance was recorded on September 12, 2015 at Favela Worldwide in Brooklyn. A new album, "Radical Invisibility", is in the pipeline with a slightly revised band, to be released in 2019 by 577 Records. 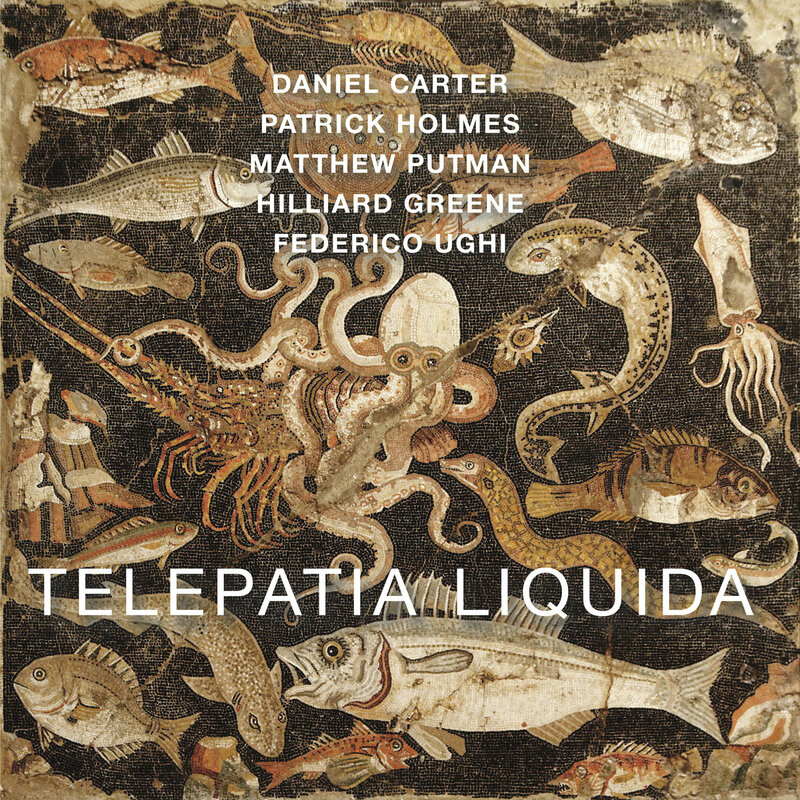 After an initial exploration of each other's sound, the rhythm section sets out on a great vamp, hard-boppish, with heavy piano chords by Matthew Putman, a pulsing bass by Hilliard Greene and the hard-hitting drums of Federico Ughi. It's a majestic train that's set in motion, offering the wonderful foundation for Daniel Carter on reeds and trumpet and Patrick Holmes on clarinet to intertwine their soloing with increasing intensity and power, only to slow down again for a more fragile and exploratory mid-section, after which the intensity picks up again. On the second track, "Shine-A-Town", first Ughi, then Carter set the tone for a piece with shifting moods and levels of intensity. It starts wild and ferocious, yet changes rather quickly into a subdued and calm mode, as if once entering through the gate of the improvisation, the inside is quite friendly and welcoming ... until Putman's ascending harmonics and hammering chords drive the other musicians into more intensity and power, including drums and bass to weave a wild tapestry of branching sounds, collectively stopped with one strong chord, to the pleasure and appreciation of the live audience. "Throne", the last track, offers an unexpected quiet start, with music that sounds like a ballad, initiated by the piano, over which Holmes' clarinet and Carter gently interlace their freely evolving lyrical phrases. The middle part becomes more boppish in nature, even if the rhythm remains rather implicit. The middle part is full of wild intensity, propulsed forward by Putman and Ughi, shifting back to a quiet duet of the two reeds, and ending with what the whole album is all about: raw authenticity, jubilant and glorious interplay, and a feeling of fun that transcends into the deeper level of real art: clever, meaningful and forcing the listener to remain vigilant to capture frequent shifts in direction and to be transported by the emtional force of the delivery. If their previous album, "Telepathic Alliances", was only a first collaboration of the five musicians, their sophomore release is even stronger, and more telepathic, if that overused term is still acceptable. Available on Bandcamp, but also in 300 copies in vinyl. 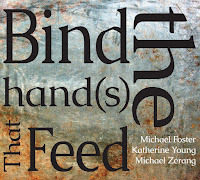 To be released on December 7th. 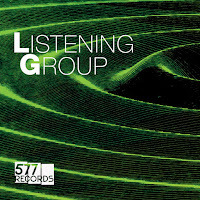 Again, a totally different musical universe opens with The Listening Group, a band 'led' by Daniel Carter, or maybe 'initiated' is the better word, because the band's concept resides in collective improvised composition, based on active listening. The musicians come from diverse backgrounds and instruments: Daniel Carter on alto, tenor, soprano and trumpet, Claire de Brunner on bassoon, Patrick Holmes on clarinet, Nick Lyons on alto saxophone, Jeff Snyder on Electronics, Stelios Mihas on guitar, Jonah Rosenberg on piano, Zach Swanson on bass, and Federico Ughi on drums. The result is a genre-defying album that holds the middle between a classical ensemble, romantic music, modern composition and jazz ... and then more. The collective demonstrates Carter's vision on life and on music, in which the total is more than the sum of its parts, in which spiritual beauty and unity arise when things things converge. He writes in the liner notes: "Each of us has her/his musical view, philosophy, way of playing, personality, and thus, makes her/his unique contribution to the overall alloy/alchemy/sound of the Listening Group, but we all most probably would agree that the Listening Group is majorly about listening, playing in such a way that each and every player can be clearly heard by each and every other player, notwithstanding the fact that some instruments in the ensemble are capable of playing much louder than others. The Listening Group mind, heart, body, soul, spirit, character, is brought into being by the mind, heart, body, soul, spirit, character, of each of its players". 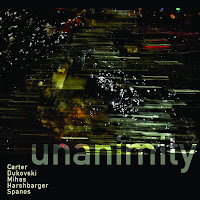 The music is ambitious, and amazing: it creates a semi-dense and warm sonic universe in which instruments ebb and flow into a common pool of sound, in which individual voices are still identifiable, yet are irrelevant on their own. The atmosphere is open, neither dark nor optimistic, and brings to mind images of organic growth in nature, in which a wild yet seemingly organised whole comes into existence out of strangely unrelated and unpredictable components. The only thing that keeps them together is the listening. All instruments grow into a collective landscape. The album is released in an exclusive limited edition of 300 hand-numbered vinyl LPs. Luckily, it's also available on Bandcamp. 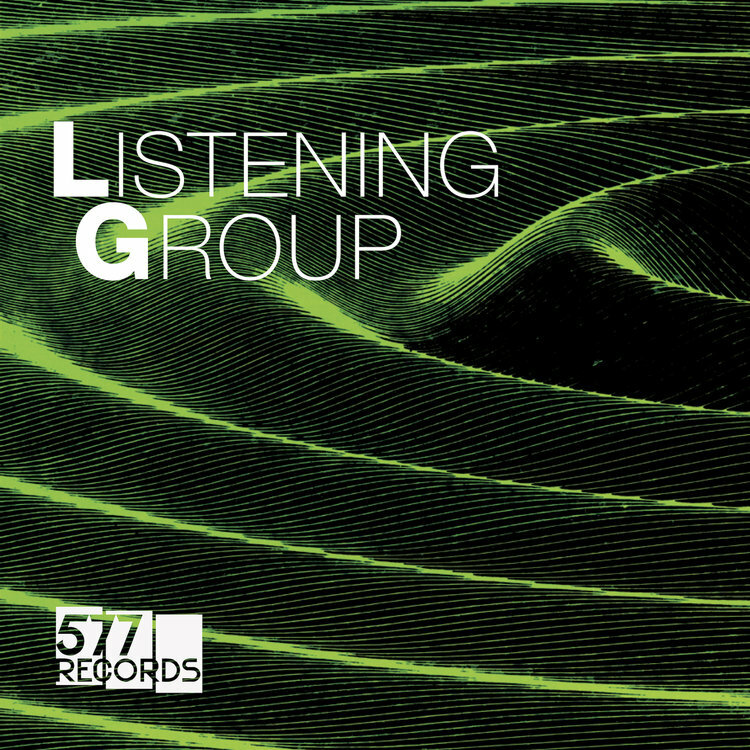 Because of Tobias Wilner electronics and beats, the album is somewhat reminiscent of the work that Matthew Shipp produced with his Thirsty Ear recordings, and the Blue Series Continuum band, and especially "High Water" with El-P, combining the free flowing melodies of the soloists with solid yet subdued techno beats. 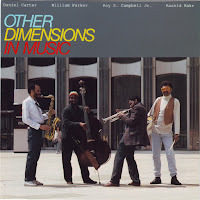 On that album, Carter was accompanied by Roy Cambpell, Steve Swell and Matthew Shipp as soloists, but on this album, the only soloist is Daniel Carter, which makes the overall sound a little less rich, but because he switches instruments once in a while, variety is offered in return. The other musicians are Djibril Toure on bass, and Federico Ughi on drums. Toure is (one of) the bass player(s) of the famous Wu-Tang Clan hip hop band. The end result is a mesmerising blending of genres, with repetitive and trance-inducing beats over which Carter adds his solos and Ughi his creative and rock solid drumming. This will not be for the purists (purists? really?) among our readers, but this a very enjoyable album, which will hopefully also bring non jazz fans to this kind of improvised music. 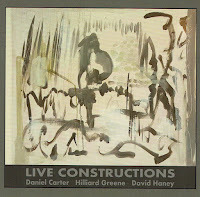 "Live Constructions" starts with a beautiful slow piece with Carter on trumpet, Hilliard Greene on bass, and David Haney on piano. Even if freely improvised, there are references to gospel, cool jazz and bop, in a wonderful interaction between three musicians who've done it all during their career. Haney's presence is decisive on this album. He is under-recorded in my opinion, and his other albums are easy to recommend: he combines a clear sense of harmony with very creative inventiveness in creating a sound which is both intimate, lyrical and even funny at times. The performance is the first meeting of all three musicians, organised by WKCR Radio based at Columbia University, New York, as part of their weekly programme "Live Constructions". David Haney writes: "I have found that some of the best music comes from first encounters. As per my usual style of collective improvisation - we don't discuss what we are going to play. Just as you wouldn't discuss what you are going to talk about, I see no need to talk about improvised music before or after it is performed. To me we are just talking." And that is indeed the case here. In contrast to some of the other albums reviewed in this list, the overall mood is calm, slow-paced and warm. 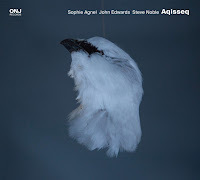 This end result is a very inviting album, performed with felt precision by three artists who no longer need to prove themselves, but who at times appear to be more focused on delivering on the expectations of acceptability of a radio programme rather than creating a new sound. It's a nice album, but a little short with less than thirty minutes of music. 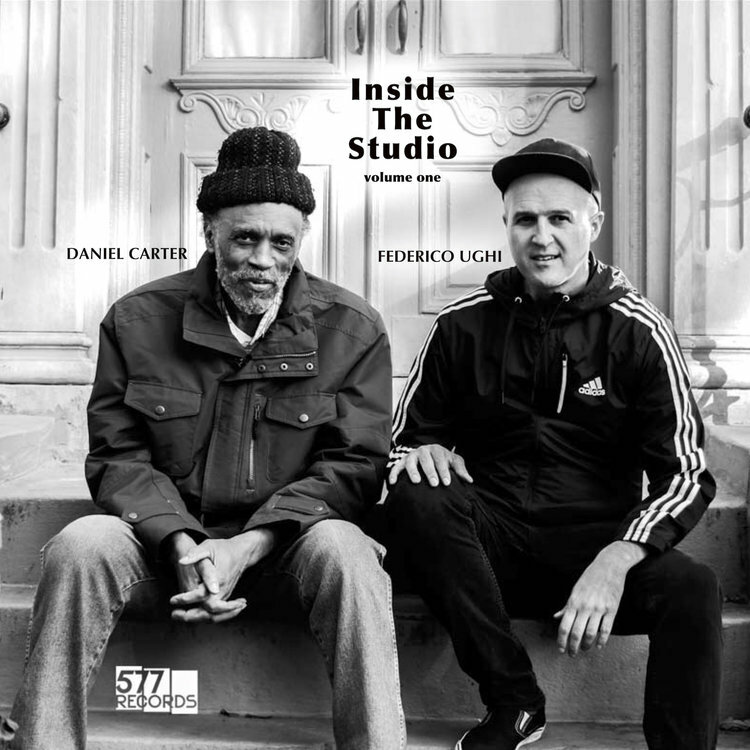 According to my estimate, this is the 5th duo album between Carter and Federico Ughi, and to celebrate the event, it's released in an exclusive limited edition of 10 (!) hand-numbered CDs. Luckily, the music is also available digitally via Bandcamp. The sound is not different than on the other albums: a great spontaneous interaction of two musicians who are fully comfortable with each playing. Ughi is a master at keeping pulse with an open rhythm, allowing Carter's natural lyricism on his various instruments the freedom to evolve and develop, while once in a while picking up the rhythm in his phrasing. Carter switches instruments, which keeps the variation high, even if his natural preference and strength lies with the sax. 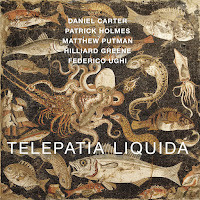 On Polyhedron, Daniel Carter and drummer Andrew Barker play tribute to their friends and musical partners Roy Campbell, Sabir Mateen, William Parker and Charles Waters. It's the second cassette released by the duo, the first one - Common Soldier - already dating from 2001. Andrew Barker is known from his work with the Barker Trio, the Gold Sparkle Band and William Parker's Little Huey Creative Orchestra (in which Mateen, Waters, Campbell also performed). On Polyhedron we get four improvisations of twelve to fourteen minutes, alternating between calm explorations and wild interplay (and Barker offers some real powerplay on the second and third track). The album offers everything you can expect from two artists with their background. 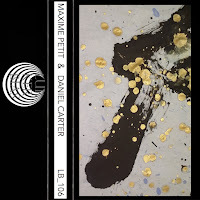 The playing is excellent, with Carter primarily playing sax, except on the last track, which starts with spiritual and peaceful flute-playing, and turning more melancholy when Carter switches to trumpet. This cassette release shows again a the versatility of Daniel Carter, now performing - on sax only - with French electric bassist Maxime Petit. The latter's style is more rooted in rock and noise than in jazz, and hence more direct and explicit, but nevertheless both musicians find a common language to dialogue. The result is surprisingly gentle, with soft-spoken and intimate musical conversations. The amount of music you get is short, with six tracks totalling less than twenty minutes. And maybe that's good, as I had the impression that everything had been said by then. 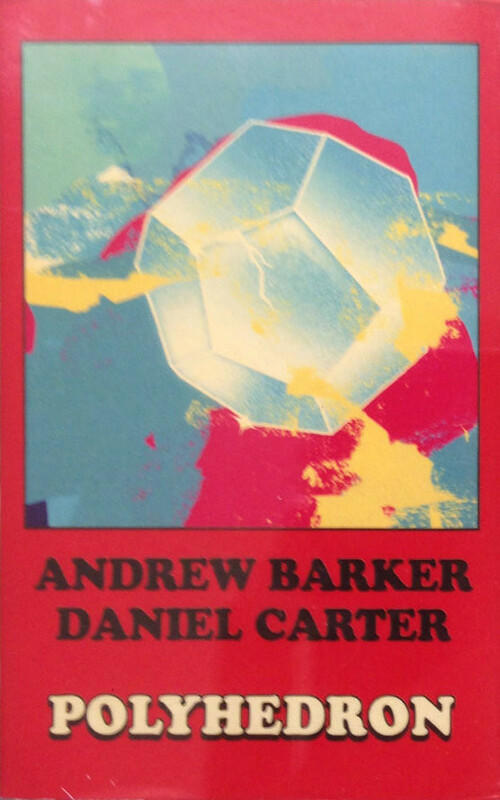 Only for completists of Daniel Carter's oeuvre. 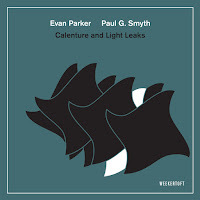 This is one of my all-time favorite free jazz albums, and it is great that Silkheart made it now also digitally available. The original album was released in 1990, and it still sounds so incredibly fresh. If you don't know it yet, check it out: mandatory listening! A re-issue on vinyl of the CD that was released in 2009, obviously shorter in length. I think that Other Dimensions in Music is from 1990. Thanks Rui, you're absolutely right. I will rectify this. He has certainly been very prolific over the years. I enjoy him and i assume alot of others do to by his output.